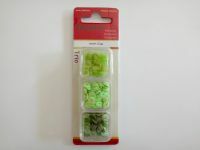 The actual description of this sequin trio pack is Peridot, a bright mid green. The pack contains three 4g boxes of sequins each with a different type of green sequins; a satin finish, sage green, a lighter sparkly green and a beautiful iridescent almost transparent green that looks almost gold when it catches the light. The sequins can be sewn on to fabric to decorate clothes and home furnishings or glued on to card, paper etc. for other types of craft projects. The would also look gorgeous inside shaker cards, mix them with red sequins for a traditional Christmas style. Size 6mm diameter.